When I was growing up, I was well aware of our family rules and those of our neighborhood, which were intended to ensure safety and foster kindness, integrity and good manners: Look both ways before you cross the street. Share. Don’t go swimming without telling an adult. Say ‘please’ and ‘thank you.’ Pick up after your dog. Put trash in its place. Be home before dark. We respected those rules for the most part because we understood that, at the other end of this short list of restrictions, was a long tether of outdoor freedom. There was a great sense of comfort found in community. Parents knew each other’s kids by name. Everyone looked out for everyone else. Bikes got left on neighbors’ lawns and returned the next day. The bigger kids climbed the oak tree when the cat got stuck. Kids got in fights. And every once in a while, someone broke a rule. But we knew we were trusted even when we made mistakes. We also knew that the consequences of breaking those rules would be proportionate to the ‘offense.’ If you pushed someone down, you said you were sorry and helped them up. If you destroyed a flower bed, you offered to replant it. If the baseball you threw ended up in someone’s living room, you took on a paper route or raked the leaves around the neighborhood until you could pay to replace the window. At least that was the idea. Things got worked out. No one called the police. Ever. She received many comments in response, mostly describing the neighbor’s reaction as disproportionate, possibly race related and certainly frightening. Some suggested taking a ‘kill her with kindness’ approach, suggesting perhaps this woman was just old and lonely. Others strongly suggested my friend find out exactly what the neighborhood rules were as well as her children’s rights. After days of distress and reflection, she ended up drawing from the pool of advice and compromised. She proactively talked to her neighbor and let her know that yes, her sons would comply with her wishes. She also let her know that she found her threat to call the police unacceptable and why. And she explained that she had gone to the police community relations division to apprise them of the situation in the event of further complaints. Knowing my friend, she did this with both grace and authority. And it ultimately worked. The neighbor backed off because she no longer had a victim. By arming herself with knowledge of her children’s rights and the courage to confront her neighbor in a firm but non-threatening way, she was able to defuse the situation. The world is not risk-free. And we should always keep our children’s safety in mind. But we need to find a middle ground between zero tolerance and plain common sense. Buying into the culture of fear and propagating it by following rules which harm our children isn’t the answer. We need to rely on the knowledge of our rights as parents and those of our children in order to be part of the solution. The good news is that people are coming together on this issue on a community, national and global level by resurrecting the supportive role of small communities, by actively influencing local legislation, by enlisting local and national political support, by raising awareness of children’s rights and by offering solutions on how children can safely enjoy the many benefits of outdoor play and the exploration of nature. For more information, to find nature clubs or regional campaigns in your area, see the Children and Nature Network. In Part II, I’ll be addressing the criminalization of children in schools and how it affects homeschooling in the U.S.
That first photograph is quite astonishing!! What constitutes play these days then?? This is an excellent read with so many gems! The pearl for me is in this::: “Buying into the culture of fear and propagating it by following rules which harm our children isn’t the answer. We need to rely on the knowledge of our rights as parents and those of our children in order to be part of the solution.” . . . . . ..it’s all well and good to encourage and tell our children to stand up for themselves, but it gets juicier when we show them how it’s done and that yes, we walk our talk so to speak, even when it’s tough. Often times by following harmful rules the harm doesn’t come from the rule itself but from the parental following of something that the family as a whole knows isn’t in accordance with their way or whatever you want to call it; as between the lines kids read it as . . . well mum/dad don’t believe x,y,z but they’re too afraid to deal with it . . . .so when they’re in an intimidating situation the base pattern might be to do the same, perpetually backing off and this can spiral into anger, silence, confusion, etc. if it grows as the kids grow . .. . I think it’s really important for mums/dads to Be intimidated if they are and at the same time take that as an opportunity to stand in their own vulnerability, openly, thoughtfully, and bravely dealing with the challenge of the day, which is a whole other paradigm, at its core it’s honest, so it perpetuates authenticity amongst other things . 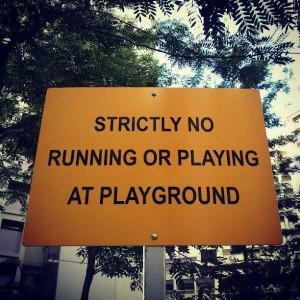 .. . .
Hi Mariam, that photo is an actual sign that was put up in a playground in Singapore! It was put up because the people who lived near the playground were complaining about the noise! It was rapidly taken down after protests and ridicule from parents and children! But it served as a good illustration to make my point. I completely agree with you that we need to be role models as parents when challenging rules and regulations–that’s an excellent point. If we stick our head in the sand and don’t fight for our rights, our children will follow in our shoes. Thanks for your comment. Authenticity all the way . . .
Ah… once again, Ellen, you speak my LANGUAGE!!! My children sometimes go to a place called the Learning Centre where they spend the day playing, building, climbing trees, making forts, swimming, making science experiments, etc… with a whole bunch of other unschooled / homeschooled kidlets. It’s a nice sort of chaos – the kind that reminds me of *MY* childhood… where I was free to roam, climb, visit friends, gallop my horse down country roads… whatever. At the Learning Centre, I often arrive to find my daughter and 3 of her friends up on the roof of the Wendy house. They get down by leaping expertly from the roof – onto a tree (that’s about a metre away)… and slither down the boughs like lithe little monkeys. I *WANT* this for them. I do not WANT them to be filled with all kinds of irrational fears. Fear doesn’t save us from The Monsters or keep us safe from harm – fear *IS* the Monster. It robs us of life. It keeps us confined in prisons of our own making. And worse – it’s contagious! Anyway (back to the point I was making) – so every afternoon… the swimming pool is opened and all the kids get to swim (yes, there’s an adult looking on)… but apart from that – there’s not a long list of Pool Rules. The kids jump, dive, do somersaults… whatever. Anyway – so yesterday – Joah (whilst showing off his latest somersaulting trick)… misjudged the edge of the pool – and landed on his head – on the paving. He had 2 holes in the top of his head which required 5 stitches. Under the crazy circumstances that we’re seeing in the world today – somebody might (after seeing Joah’s bleeding head) decide that there now needs to be a long list of POOL RULES – for-the-children’s-safety (of course). Like… “don’t jump”… “don’t dive”… “don’t run”… “don’t splash”… “don’t do handstands”… “don’t do tricks”… “don’t hold your breath underwater for too long”…. blah, blah…. I just don’t view the world in that manner. I’m pretty certain that Joah will now think twice before his next somersault – and it has taught him a lesson in exercising a level of caution in the pool. And so it is with life and the lessons we learn along the way. I wonder what kind of a generation we’re raising with all this crazy fear-mongering…? Dearest Heather, thanks as always for your thoughtful comment. First of all, I hope Joah is feeling better! And yes, you’re right, although you hate to see your kids get hurt, they are actually capable of learning lessons from their experiences (both positive and negative). It seems that we’ve lost the distinction between putting our kids in dangerous situations where there is a good likelihood that they’ll be injured and trying to prevent them from ever having an accident. We learn from accidents! I still do. And the fear-mongering and ridiculous rules smack of early efforts to raise little sheep that follow the herd without ever challenging their parents, their teachers, their bosses, their friends, the police, or the system. (ooh, I should’ve written that in my post! damn.) I also feel like there is an insidious undercurrent of general dislike for children going on, reminiscent of the victorian era of “children should be seen, not heard.” On the other hand, there is the homeschooling/unschooling movement which we are thankfully part of which is bringing certain freedoms back to kids. Polarity–this theme keeps coming up again and again. Anyway, I hope Joah keeps running, diving and jumping in the pool of life! The trend seems to be to discourage children from developing meaningful self-control while simultaneously demanding their absolute and unquestioning compliance to arbitrary demands by authority. While seemingly contradictory, the two have in common discouraging the development of real inner strength. Thanks for your insightful and accurate comment. May I quote you, anonymously or with credit, for the second part of this article on the criminalization of children in schools?